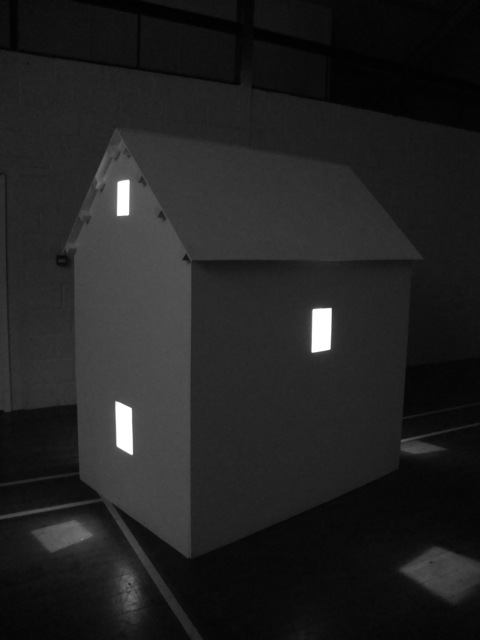 The first Townlands Exhibition took place in August 2009 as part of the Visual Art Programme of the annual Kilkenny Arts Festival. The exhibition was staged in our local community hall, Johnswell Hall, as the primary target audience for our work and engagement is local. It is essential to the project’s integrity that this audience remains central to its process and goals while it is also hoped that the work has wider relevance. The hall itself, kindly provided by the Johnswell Development Committee, is a most challenging exhibition venue. It is a space used mostly as a sports hall with a couple of other rooms attached. It was soon clear that the exhibition would have to take place in darkness and that we would create small galleries and installations within the hall which would be internally lit. We also decided to project large-scale images of the local landscape upon the walls. One space was used to exhibit Gypsy Ray’s photo-documentary work of the old Kilkenny Mart, where all local livestock would have been sold along with her new series of large graphite drawings. 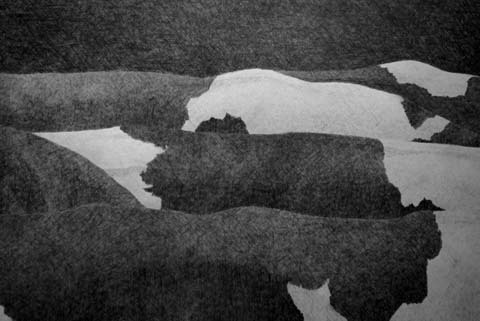 "Moving Along" graphite drawing, Gypsy Ray, 2009. My own sculptural contribution was the creation of an installation based on maps of the local landscape. This work was a continuation of an exploration begun as part of the New Sites-New Fields commisions at the Leitrim Sculpture Centre in 2008. In that process, using the National Monument, Teach Sheáin Mhic Dhiarmaida, and its surrounding landscape and field patterns as a kind of vernacular totem, I had explored the indigenous house form as a now ruinous abandoned space with the past it once embodied, (or in De Valéra’s terms “enshrined”) now open to the elements and inevitable erosion. Here in Johnswell, where I experience the landscape as more familiar and vibrant, the house form is whole although inaccessible. Through its window the local landscape can be read by the internal light. The past cannot offer the comfort of shelter but can suggest an understanding of it. Through the structure’s windows one can view maps of the local landscape drawn upon its walls. The Shelter of the Past, installation interior, Counihan, 2009. The third element of the exhibition was a photo-essay comprising images of the surrounding landscape interspersed with lists of the field names and place names gathered to date as part of the project’s research strand. The images were projected on a large scale and in black and white in tone with the other exhibits. 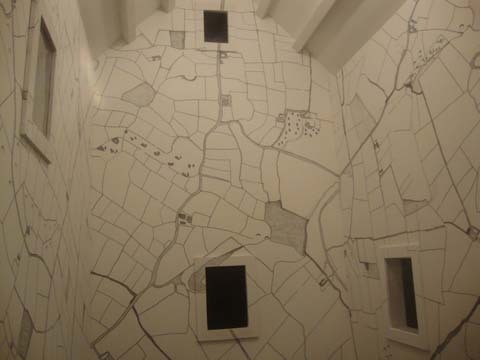 As part of the exhibition there was also a participatory space in an adjoining room where large six inch maps of the nine townlands within the old civil parish of Rathcoole were on display and on which visitors were invited to write the field names of their farms or to leave contact details so that they might do so over the winter months following their own family research. The exhibition was opened by Catherine Marshall. In her address to the audience Catherine spoke of her own familiarity with Kilkenny’s landscapes, growing up as she did near the village of Stoneyford, of how formative was the intimacy with the place of her childhood, and of what we place at risk when we grow careless of our past both on a local and a national level. These insights have also been central and informative to the Townlands Project from the outset. Refreshments were provided by the local community making for a memorable occasion.